Leading Exporter of ropp cap sealing machines from Thane. We fabricate a wide range of ropp cap sealing machines is highly in demand in various industries owing to its capability of tightening most type of caps such as plastic caps, LDPE, HDPE, PET, and glass packaging. We also offer change parts for different sizes and bottles as pr the client requirement. We follow stringent quality control procedures in order to avoid discrepancies at clients end. 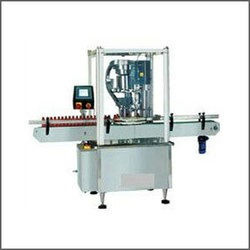 Our range of ropp cap sealing machines is known for its excellent output of 50 bottles per minute. Looking for Ropp Cap Sealing Machines ?